Please Note: Completing the following web form and clicking submit gives the same authority as if you have physically signed each form. if you have any questions please contact our Membership Secretary via email before you submit the web forms. This web form is available alongside PDF versions, Membership Application & Gift Aid Declaration and GDPR Data Consent Form, if you prefer you can print, fill out, sign and post the PDFs. Whichever method you use to submit your forms you will still need to send a cheque by post for Life Membership as detailed in paragraph 5 below. a. 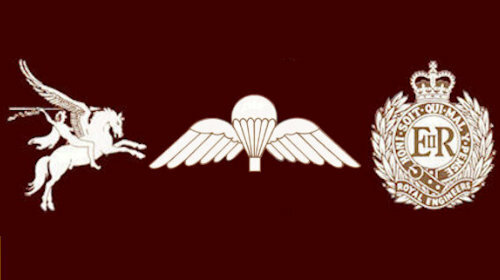 All personnel who have served on the strength of an Airborne Engineer unit. The committee reserves the right to veto an application for membership where they feel this is in the best interest of the Association. as per the AEA Constitution, which states "The Council reserves the power to veto an application for membership if it considers it is in the best interests of the AEA to do so. Such applicant has no right of appeal and his/her Joining Subscription shall be returned in full if already lodged." (The rate above includes a membership card, lapel badge and subscription to the current year of the Airborne Engineers Journal). a. Applicants may be requested to provide proof of eligibility commensurate with paragraph 1a. above. b. Although optional, a passport size photograph of the applicant would be helpful and can be affixed to the membership card. Applicants who are UK taxpayers are strongly encouraged to complete the Gift Aid Declaration Form attached in order that all sums donated to the Association including those fees at Paragraph 2 above may be treated in accordance with current legislation and tax recovered to the Association. If you choose to use this web form to apply for Membership you do not need to post manually printed forms with your cheque. * All donations I make from the date of this declaration until I notify you otherwise. * All donations I have made since 6th April 2000 and all donations I make from the date of this declaration, until I notify you otherwise. • Please notify the charity if you change your name and/or address while the declaration is still in force. • You may cancel the declaration at any time by notifying the charity - it will then not apply to donations you make on or after the date of cancellation or such later date as you specify. 2. You must expect in the current tax year to pay an amount of Income Tax or Capital Gains Tax at least equal to the tax the Charity reclaims on your donations. 3. If in the future your circumstances change and you no longer pay tax on your income and capital gains tax equal to the tax that the charity reclaims, you can cancel your declaration (see note 1). 5. The information you give will remain confidential and will not be passed to any organisation other than the Inland Revenue. 6.You may also ask your local tax office for leaflet IR 113 Gift Aid. To receive information and correspondence from the Airborne Engineers Association Charity Number 1009201. In order to comply with the EU General Data Protection Regulation (GDPR), we need to have your consent to hold your personal data and continue to communicate with you by post, email or phone. You may wish to have all or some of your details entered onto the database or not to have any of your details recorded at all. Please make your options known on this form. Remember if the association does not have any contact details then you cannot receive any information or correspondence. 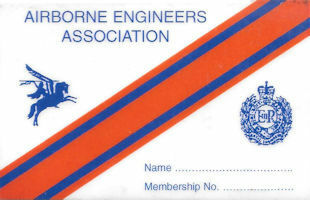 The Airborne Engineers Association (including its associated branches) currently hold members details such as Name, Address, Phone Numbers, Email Address (not all members) and wife/partners name (not all members). This web form is to be used when confirming your acceptance to the Data Protection Officer of the Airborne Engineers Association. If you are satisfied with the information that we hold for you and that it will remain confidential for the use of the Association and that your information will not be distributed to anyone without your permission you can either complete the form below or manually print the Data Consent Form,Membership Application & Gift Aid Declaration and GDPR Data Consent Form fill it out, sign it and hand it to the association secretary or, email or give your permission at a branch meeting that you are satisfied with the holding of your details. If you do not reply we could assume you do not wish to be included in the database and you will be removed from it and will not receive any further correspondence. You can of course WITHDRAW / CHANGE YOUR CONSENT at any time in the future. Enter below your details you wish the AEA to hold in its Membership Database and confirm Yes or No as appropriate. How do you wish to receive your correspondence? Please Note: Completing the above forms and clicking submit gives the same authority as if you have physically signed each form. if you have any questions please contact our Membership Secretary via email before you submit the forms.